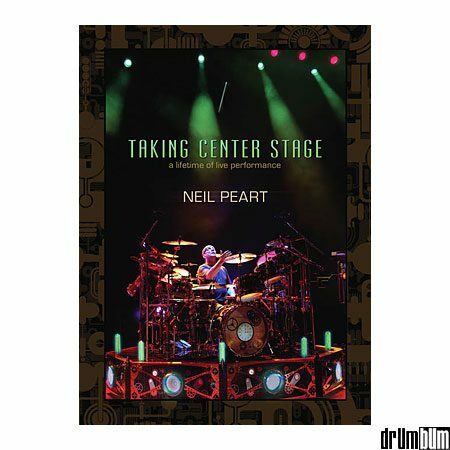 Neil Peart DVD – Taking Center Stage – Filmed in various locations over the course of a year, Neil Peart takes you on a behind-the-scenes look at Rush’s 2010-11 Time Machine tour. This includes rare and exclusive footage of Neil’s personal pre-tour rehearsals and backstage events at a Rush concert (including a visit to the soundcheck, and an unprecedented backstage interview as Neil warms up for the show). Neil also presents a detailed look at every single song in the tour’s set list. Each song features analysis and demonstrations by Neil, which are coupled with a detailed PDF eBook containing transcription of his parts. At the end of each song discussion, the viewer is transported onstage to a Rush concert to see the actual live performance of the song from the perspective of the drum cameras only. Running time is approx. 6 hours, 40 minutes. This is a must have for any fan of Neil Peart! Nicely packaged. **Please note: Opened media is non-returnable. Also check out the Neil Peart poster. Awesome Drummer DVDs at DRUM BUM!